What makes Celestron’s new NexYZ smartphone adapter (59.95US) different from other smartphone adapters? Its three-axis adjustment. Most adapters only allow adjustment of your phone in two axes, X and Y, to center its camera over the optical axis of the eyepiece That works, but what about the all-important Z axis: spacing of the camera up or down within the optical axis to maximize the field of view of the image? NexYZ gives you control to not only center your phone’s camera firmly over the eyepiece with the X and Y knobs, it then allows you to move the phone fore and aft within the optical axis, until you achieve the maximum field of view. Not only is this Z-axis adjustment ultra-precise, it’s designed to be quicker and easier than with other adapters. From start to finish, the process only takes about 30 seconds, including the time it takes to insert the phone into NexYZ, attach NexYZ to an eyepiece, start the camera app, and center the camera over the eyepiece using the knobs. If you switch phones, eyepieces, or optical instruments, you will need only make slight adjustments to re-center the camera and dial in optimum spacing within the optical axis. NexYZ fits any eyepiece from 35 mm to 60 mm in diameter, including telescopes with 1.25-inch and 2-inch eyepieces, spotting scopes, monoculars, and binoculars. NexYZ will also attach to microscopes with the addition of the included adapter ring, which takes the usable diameter down to 25 mm, the size of a standard microscope eyepiece. A strong spring and a threaded twist-lock provide a two-level strong and secure grip on the optical instrument’s eyepiece, so you can image with confidence. NexYZ also accommodates a huge range of smartphones. The phone platform stands up to rigorous field use, thanks to its robust, durable construction with a metal frame and polymer body, and is fully adjustable to fit any device – usually with the case still on. Even larger “phablets,” like the iPhone 8 Plus and latest Samsung Galaxy devices, work perfectly. The secure platform stands up to the weight of these heavier devices with ease. 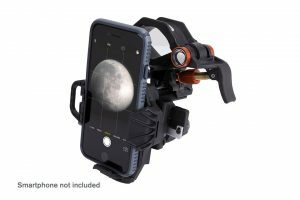 The Celestron NexYZ Three-Axis Universal Smartphone Adapter is priced at $59.99US.